Piazza Plebiscito is the largest square in Naples. It is bounded on the east by the Royal Palace and on the west by the church of San Francesco di Paola (photo, left) with its impressive colonnades extending to both sides. In the first years of the 19th century, the King of Naples was Gioacchino Murat (Napoleon's brother-in-law). He started to build, as a bit of imperial splendour, a Romanesque forum in the square. Whatever the original intent might have been, when Napoleon was finally dispatched, the Bourbons were restored to the throne of Naples; they went ahead with construction to turn it all into a church, erected between 1817 and 1831 to a design by the Swiss architect, Pietro Bianchi (1787, Lugano -1849, Naples). The portico is formed with six Ionic columns and two Ionic pillars and the interior has thirty Corinthian columns. Inside, the church is circular with two side chapels. The dome is 53 meters high. 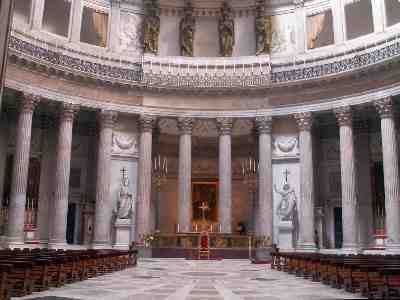 The high altar is inlaid with jasper and lapis lazuli; the side columns are of Egyptian breccia. Subsequent restorations have attempted to preserve the orignal interior. The church was dedicated to San Francesco di Paola, who had stayed in a monastery on this site in the 16th century. [More on the life of St. Francis of Paola here.] The name of the square commemorates the plebiscite, the public balloting, of October 1860 that ratified the annexation of the recently defeated Bourbon Kingdom of the the Two Sicilies to the Savoy kingdom of Sardinia (alias Piedmont-Sardinia), thus forming the modern nation state of Italy. On the north side of the square is the Naples Prefecture (photo, right). It is on the site of the old Convent of the Holy Spirit built in the early 1300s. The clearing away of the monastery was part of the general campaign by the French during the Napoleonic decade under Murat in Naples (1806-1815) to, one, suppress monastic orders and, two, rebuild the space in front of the Royal Palace. This building was started in 1810, suspended when the Bourbons returned to the throne of Naples in 1815, and then continued, following the original plans. It is a "twin" of Palazzo Salerno, the building facing it from directly across the square. 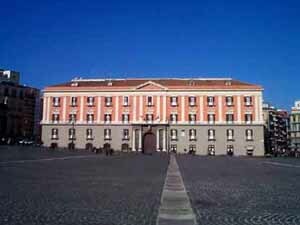 That building houses the Regional Military Command and, in spite of the identical appearance, is older; it was built in 1775 by the Bourbons to house a battalion of military cadets. Palazzo Salerno, however, was then redone to look like the newer one in the photo as part of the French and then Bourbon plan to rebuild the square. Actually, the Prefecture is better known to most because it is adjacent to the Gambrinus cafe, a favorite haunt of poets and musicians during the late 1800s and early 1900s and, today, a favorite tourist attraction. Until quite recently, the square had been allowed to fall victim to an urban decay of sorts; i.e. it had turned into one gigantic parking lot. As part of the general plan to make the city more enjoyable for residents and visitors alike, Piazza Plebiscito was cleared and restored by the city government in the early 1990s. It is now one of the big tourist attractions in the city, a good place to stroll and get your bearings. The square hosts various celebrations during the year, from rock concerts to annual New Year's Eve festivities. It is also the site of periodic displays of "installation art". The name of the square honors the 1860 plebiscite that ratified the unification of Italy.